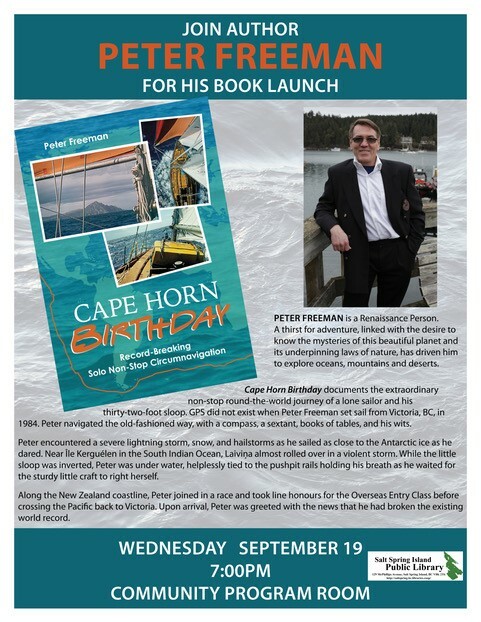 Peter Freeman launches Cape Horn Birthday, the non-stop round-the-world journey of a lone sailor and his thirty-two-foot sloop. He set sail from Victoria in 1984, and he navigated with a compass, a sextant, and a books of tables. He had to rebuild the self-steering rudder, repair torn sails, and fix broken gear. Peter encountered a lightning storm, snow, and hailstorms as he sailed close to the Antarctic ice. In the South Indian Ocean, Laiviņa almost rolled in a storm, and while the sloop was inverted, Peter was under water, tied to the pushpit rails holding his breath as he waited for the craft to right herself. Along the New Zealand coastline, Peter joined a race and took line honours for the Overseas Entry Class before crossing the Pacific back to Victoria, breaking the world record for non-stop solo sailing circumnavigation. Peter grew up in Noosa Heads, Sunshine Coast of Queensland, Australia. He lives on Salt Spring where he writes novels, poetry, short stories, children’s books, stage and screen plays, and currently the story of cycling solo around Australian and a fictional adventure. Peter’s work has been published in magazines and newspapers.